Having a baby as a new addition to the family can bring immeasurable joy. Sure enough, being a parent has its ups and downs and it is definitely a life-changing experience. However, the expense that comes with it is horrendous, eating a huge portion of your finances. Make the call first. Talking to specialists is part and parcel of having a child, pre and post pregnancy. Every time you step on your doctor’s clinic, you have to pay for supplements and professional fee. If there’s any health concern that aren’t really urgent, talk to your doctor on the phone for advice. Maximize insurance and government benefits. For employed mothers, you can ask your healthcare provider about their packages. Government agencies like SSS and PhilHealth can also provide you financial assistance. Though these may not pay for all for your delivery expense, utilizing your benefits can lessen your financial burden in some ways. Breastfeed your baby. Nurse your child on his/her first year if possible. This will save you thousands of pesos from buying formula milk. Also, this will lessen the possible health expense of your newborn as breastmilk has natural antibodies to strengthen your child’s immunity. Take it easy on shopping. Babies grow fast and they won’t fit on their clothes, shoes, and other apparel sooner. Buy only a few pairs and shop after a month or two. Besides, family and friends tend to buy baby apparels as gifts. Use hand-me-downs. Ask a relative or a colleague who became parents earlier than you for used clothes and baby equipment like crib, walker, stroller, sterilizer etc. You may also ask them for maternity clothes so you won’t have to dent your finances for maternity wardrobe. Ask for samples. From your obstetrician-gynecologist to your pediatrician, you can get some products for free. Typical samples are baby soap, rash cream, diaper, baby cologne, wet wipes, formula milk. Veer away from buying toys. Most babies play with stuff that aren’t actually toys, like spoon, and bottles. Be resourceful and improvise instead. Make your own rattle made out of plastic bottle and add some colors to it. Babies won’t mind if it’s new and expensive. They just want to be entertained. Prepare baby meals. When he/she is already able to ingest solids, you can start picking from own your food to feed your child. This will lessen your cost on buying prepared baby foods. Sharing won’t add up to your budget as it will only take very little portion from your plate. You can blend or mash potatoes, carrots, and rice for instance. Discuss with your pediatrician about your child’s proper nutrition. Get the highest quality diaper. You may opt for cut-rate items but diapers should be an exception. Cheap diapers are made from low-grade materials; they leak and cannot hold pee and poop for longer hours. Choosing good quality diapers will save you from frequent nappy change and from throwing away stained clothes. Ask a relative to take charge. If you and your partner cannot leave your jobs to look out for your child, it is best to ask a relative to babysit. Aside from the reality that nannies’ rates are pricey, hiring someone from the family will give you peace of mind. 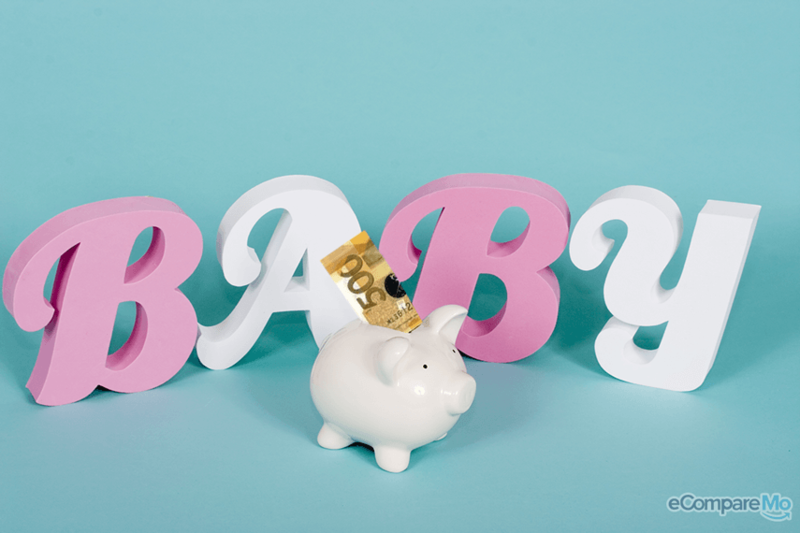 Providing your newborn with his/her basic needs doesn’t have to drain your finances. Remember that you are not alone in raising your child because family and friends can lend assistance on your new journey. eCompareMo eCompareMo is the No. 1 financial e-commerce site in the Philippines. Follow us on Twitter and Instagram: @ecomparemo.